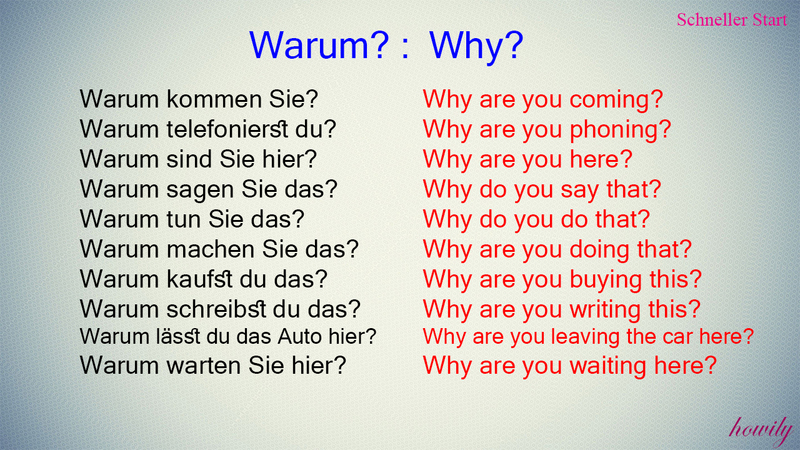 Our duty is to make German easier to learn, through pictures, videos and grammar explanations in English with lots of sample sentences. However our fans shouldn't be passive, because they have at the end of each lesson a couple of exercises to do and then we will correct them and all this for FREE. Home / Schneller Start / Warum? Warum kommen Sie? Why are you coming? Warum telefonierst du? Why are you phoning? Warum sind Sie hier? Why are you here? Warum sagen Sie das? Why do you say that? Warum tun Sie das? Why do you do that? Warum machen Sie das? Why are you doing that? Warum kaufst du das? Why are you buying this? Warum schreibst du das? Why are you writing this? Warum lässt du das Auto hier? Why are you leaving the car here? Warum warten Sie hier? Why are you waiting here? Warum nimmst du den Zug? Why are you taking the train? Warum gehst du zur Bank? Why are you going to the bank? Warum fragen Sie das? Why are you asking this? Warum brauchst du Geld? Why do you need money? Wozu brauchen Sie das? Why do you need this? Wozu sagst du das? Why do you say that? Warum antworten Sie nicht? Why don't you answer? Warum lässt er das Auto hier? Why is he leaving the car here? Weil es kaputt ist. Because it is broken. Weil ich schnell nach Berlin muss. Because I have to go to Berlin quickly. Weil ich Geld brauche. Because I need money. Wozu brauchst du Geld? Why do you need money? Weil ich ein Auto kaufen möchte. Because I want to buy a car. Weil ich reisen möchte. Because I want to travel. Warum antwortest du nicht? Why don't you answer? Weil ich nicht will. Because I don't want to. 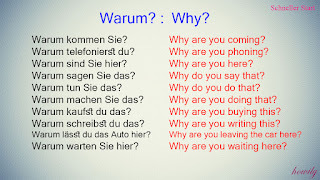 German for All©. Powered by Blogger.